Patented, one piece, cast aluminum Reed Block system that delivers guaranteed bolt on performance. Carb boot, Carb boot clamp and gasket provided. No modifications required. The Rad Valve lives up to what it says. Personally, I'd be careful though and wouldn't try much leaner on the mains like Boyesen instructs. I jumped a few richer & could even go up more. is the intake boot included on the kx 500 rad valve? 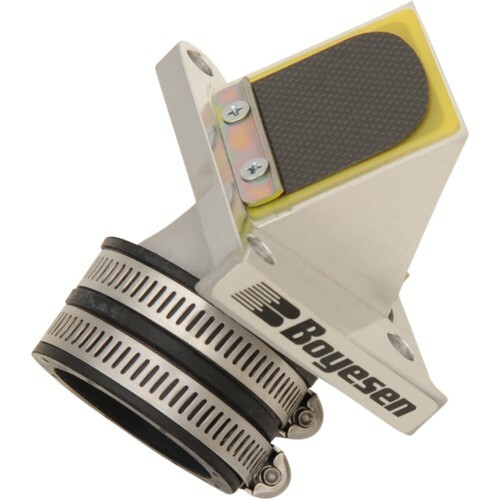 Yes, the intake boot is included with every Boyesen Rad Valve kit. You also get the boot clamp and gasket to go with it. It'll bolt straight to the OEM carburetor of any machine we have listed in our fit guide without issue, guaranteed! Boyesen Rad valves are designed to fit the OEM carburetor. That is to say, the intake size as the same size as the OEM unit on your Yamaha Blaster. Does this come with reeds or do I have to buy reeds separate? Yes, the reeds are indeed included with each Boyesen Rad valve. You need not purchase those separately. Everything you need to fit this to any machine you see in out fit guide is included in the box.